My quest for perfectly fitting socks moved along this week. I got both sock heels finished. 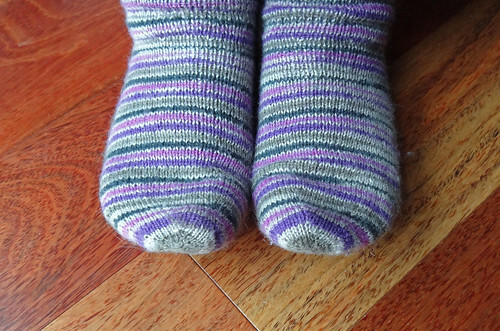 I still love hand knitted socks even when they don't quite fit. I shall probably never stop searching for the perfect sock pattern. Adding extra stitches will mean less pulling around the ankle and less rollover at the cuff. 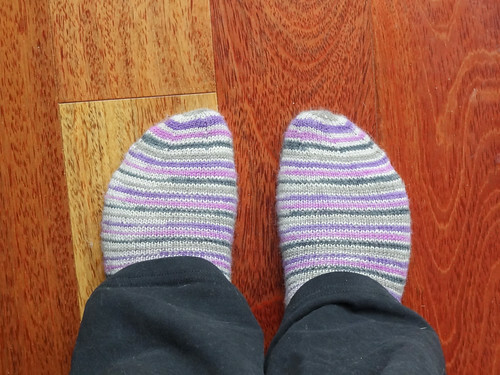 I have been writing up a basic sock pattern based on the techniques used in these socks and have added an extra 6 stitches just before adding the waste yarn to hold the heel opening stitches. This should not only stop the ankle pulling but make the leg fit better. 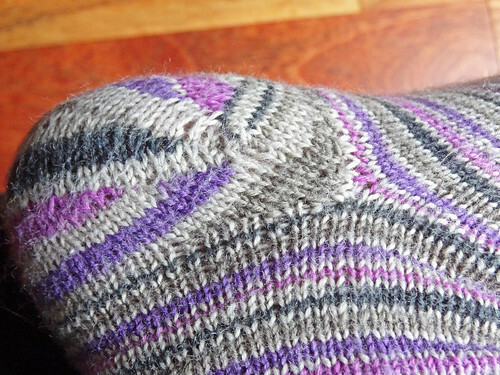 After completing the second heel, my dig 'n' lift technique improved significantly. 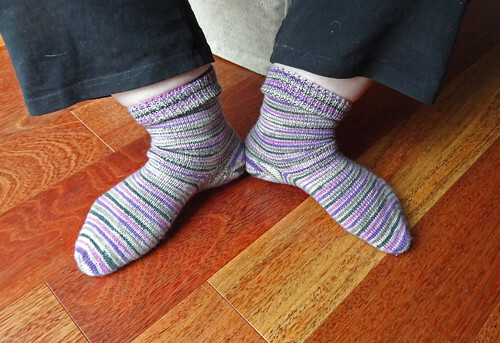 There is no weird puffiness around the turning point in the second sock. Also my grafting improved as the end of the graft didn't look too bad this time either. I do admit that the heels look a little odd done in self-striping yarn, but as they are rarely on view I don't care, especially as it is the best fitting heel I've ever worn. I am still undecided about the toe shaping. Increasing in a spiral at the toe gives a nice smooth start to the toe, it is also pretty easy to remember the directions for increasing, but it doesn't look as neat as the short row toe, like I used in these socks. I stopped using the short row toe because it was a bit more of a hassle, using a provisional cast on. The wedge toe I used in these socks fit nicely but don't look that smooth. 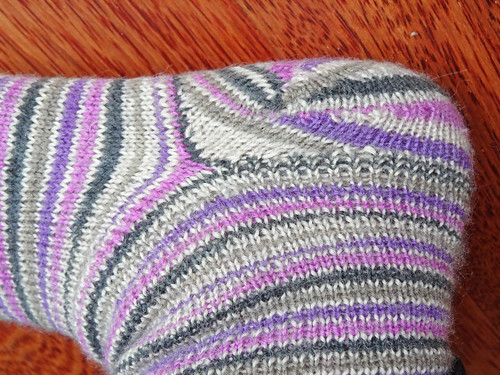 Maybe I'll go back to trying the short row toe once I get my stitch counts sorted out, as it does look really smart. I wonder if the quest for perfect socks ever really ends? 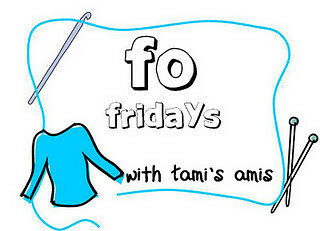 To see other finished projects, click on the button.